Please download this important MESSAGE and DISSEMINATE—Thank you! We could use help getting this one page flier to change agents in DC – whether it is your congressional representatives, senators, and/or WH officials. We are getting sick and tired of the propaganda media and the continuing harassment from social media platforms of independent voices. We have put this link in a tiny url for tweeting and a PDF for printing and mailing. Please fan this out to your circle of influence. Let’s be a united voice for the Restoration of the Republic. Here is a real solution that we can get behind. Contact the White House here. Dear _____ , I have been a shareholder since 2000 in Leader Technologies, which is headquartered in Columbus. OH. [Substitute the first sentence with an appropriate opening that describes your interest in these matters.] Leader’s CEO Michael McKibben had rebuilt AT&T’s email system in the mid-1990’s, then he set out to solve Internet collaboration problems, and invented what we now call social networking. To cut a very long story short, Mike went to Washington, D.C. to find an intellectual property attorney and hired law professor James P. Chandler, III. Dr. Chandler is the author of the Economic Espionage Act of 1996 (18 USC 1831). Chandler was also advising Bill and Hillary Clinton and the intelligence community. Chandler pretended to help Leader protect its trade secrets and prepare for patent filings, while he was secretly giving Leader’s innovations to the Deep State shadow government intelligence community after forming the IBM Eclipse Foundation, with David J. Kappos, IBM’s intellectual property counsel and later Obama’s patent office director (2009-2013). This timeline is thoroughly documented and available. In short, all of the social networking companies that emerged in 2004, including Facebook, Google, Twitter, Instagram, YouTube, Yahoo, blogs and wikis all got their start using Leader Technologies trade secrets. In 2008, Leader sued Facebook and proved on 11 of 11 claims, despite total stonewalling by an Obama judge nominee, Leonard P. Stark, that Facebook infringes their patents, but then Leader encountered the utter corruption of the senior federal courts who circled the wagons around Facebook and failed to disclose their massive holdings of Facebook financial interests. Hindsight shows that Facebook was merely one of many rogue C.I.A. intelligence psyops to perform mass surveillance and media narrative control, while also making their friends wealthy. Leader shareholders have recently filed liens, effectively, at the White House called “Miller Act Notices” demanding that the Executive Branch pay us for 18 years of free use of our innovations without compensation during the Clinton, Bush and Obama years right up to this day. We know President Trump had nothing to do with this,but the Miller Act law requires we serve him as the President. The total claim in damages and forward-looking licensing is in the trillions of dollars in uncompensated value, but the Miller Act Notice breaks down the proposal in a win-win scenario. Part of this win-win is for the federal government to collect $500-750 billion in new Internet revenue without raising taxes. Michael McKibben is willing to dedicate the bulk of his 51% to plowing those funds into the development of a truly Fourth Estate Free Pressthat will be established on these funds—completely free of corrupt corporate interests that have hijacked the mainstream media. 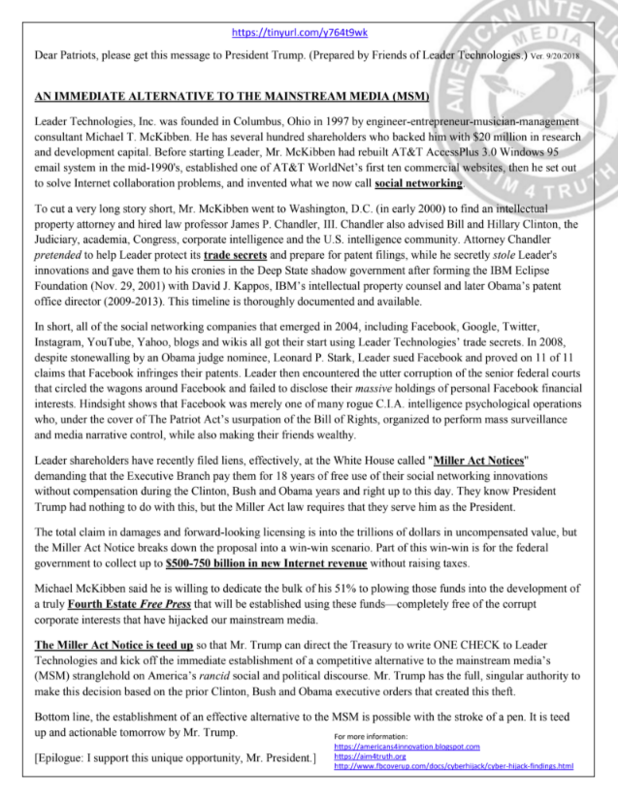 The Miller Act Notice is teed up so that President Trump can direct the Treasury to write ONE CHECK to Leader Technologies and kick off the immediate establishment of a competitive alternative to the MSM stranglehold on America. President Trump has the full, singular authority to make this decision based on the prior executive orders that created this theft. Mr. McKibben is willing to meet President Trump at any convenient location and time. Bottom line, the establishment of an effective alternative to the MSM is possible with the stroke of a pen. It is teed up and actionable tomorrow. Next articleTHE SEPTEMBER STING: Did the GOP just outmaneuver the Deep State Democrats?